This group assists foster children and families with resources to provide for the many needs of children that would otherwise go unaddressed. All their funds are raised privately and all the money is spent on the children. The greatest need they have during the holiday season is sponsorship of teens. Contact them at FocalofMadison@gmail.com and find out how you can help today. Without Kids to Love, many foster children might go without Christmas presents. You can help in a variety of ways including sponsoring a wish list, adopting an ornament, donating items, donating money and/or volunteering at one of their gift-wrapping stations. Contact them at 256-880-3455 or email at Meredith@kidstolove.org. Manna House is a Public Charity that provides food assistance for those in need. Contributions from individual, churches, civic groups and businesses support them. They need volunteers to help serve meals and to distribute clothes, toiletries and other much-needed items three days a week. They are always in need of baby items especially, such as diapers, wipes, pull-ups, baby food, and baby clothes. Find out how to volunteer at Manna House here. Volunteers are needed all year long and there are many different opportunities to serve. 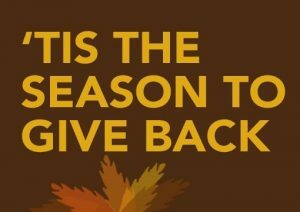 From serving food at the community kitchen to being a kettle bell ringer to working on the Angel Tree program, you will be able to find a way to help the needy. Learn how to volunteer here. You can provide a complete Thanksgiving meal and care for someone in need with a donation of just $2.04. They also welcome volunteers. Learn how you can help here. Donate here.